Are you looking to get more people to click on your blog titles? Need some fresh ideas for writing your headlines? In this article, we are sharing a complied list of stunning techniques that will help you to write irresistibly clickable blog headlines. I have searched the Internet to find some of the best techniques for you. You’ll find tips and techniques from The Guardian, Hubspot, Start Up Moon, and of course, Copyblogger. Ginny Soskey from Hubspot writes that we should spend half of the time that it takes to write an article on our headlines. Why is that? Simply put, that is why we care so much about headlines. The headline is the first kick in the race. It’s what pushes you ahead or leaves you behind. Simon Edelstyn over at The Guardian writes that titles or blog headlines that are 8 words in length had the highest click through rate–so high in fact that they performed 21% better than average. Add colons or a subtitle for a 9% better performance rate. Do not forget to add a thumbnail to your headline. According to the research, it can increase your titles click-through rate by 27%. This one caught my attention. For a 20% higher click-through rate, use odd numbers when numbering your lists. Those titles with a question mark tend to have higher click-through rates that those that do not. The next tips for techniques are some of my favorite from an infographic from Hubspot. Just so we are clear, according to Your Dictionary, an adjective is a word that describes or clarifies a noun. Hubspot recommends using interesting adjectives in your headlines.To help with this, I’ve put together a list of adjective words. Use this list as a starting point to making your own. Sometimes a list like this is all that’s needed to get those creative juices flowing. According to Hubspot, get more social shares with words like: No, Without and Stop. Quick Note: When making promises in headlines, you must follow through with that promise in the article. It is not enough just to get your article shared and liked. The goal is to get your article read. This starts with the headline and finishes with your stellar content. If your reader sees nothing else, at least they will see that you have something to offer them that they want. That is always enticing. How to Make a Cake, vs. These kinds of headlines are great because you are offering your readers not just one benefit, but two. Brian Clark of Copy Blogger points out that this type of headline is best used when benefit one and benefit two are related. While I’ve already started this piece of information above, I think it’s important to reiterate it. Your headline can be the most clickable headline ever created. However, if you do not deliver in the content you may find yourself annoying your readers. As a reader, I cannot tell you how frustrating it is to click on a headline and find out the content doesn’t expound on it. Use these techniques to help kick start your articles. Here are two of my favorite headlines we have ever published. Do you have a headline technique not listed? Please add your brilliant technique in the comment section below. I’ve been checking my headlines thru Advanced Marketing for emotional ranking. I didn’t think SEO liked using question marks or colons. You know, I have been looking into Advanced Marketing as well. I’m still trying to figure them out though. I cannot help but wonder why certain headlines do better than others. For example the Oxford Comma headline received a 100% rating through them but other headlines have not scored as high. There are certain other keywords that when I add them to a headline it automatically scores higher. I did not include them because I do not know enough to formulate an opinion. My goal is to have an article published next month about the Advanced Marketing tool. I would love to hear your thoughts about it. As to your question about SEO disliking question marks or colons, I’m not really sure. I have not heard that and that is not my experience. I’ve asked our local SEO expert Robin to weigh in with her opinion. Roslyn, thank you for taking the time to read and comment. I haven’t found any study that would indicate that a question mark or colon in a title would hurt SEO. Matt Cutts, who works with Google’s search quality team on search engine optimization issues, stated that separators like the colon in titles are fine for SEO. • A colon or hyphen in the title — indicating a subtitle — performed 9% better than headlines without. • Titles that ended with a question mark had a higher click-through rate than those that ended with exclamation marks or periods. Are you referring to a question mark in a web page’s URL? 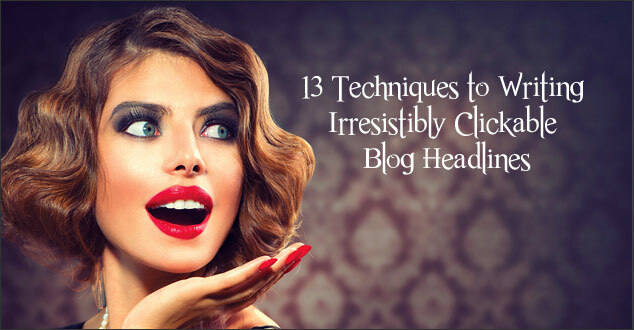 You have listed some great tips on how to create those clickable blog headlines. I myself have been getting better at creating blog headlines. I have been using a headline analyze and just recently started using tools from Buzzsumo and SEMRush to see what content gets the most shares. Headlines are the first thing that’s going to catch your audiences’ eye and if they’re not cater to their liking, then they’ll go to another blog that does. It’s simple as that. So yes, you want your headlines to be engaging, and above all you want your content to deliver on correlation to the headline! Very interesting. I will have to test this for sure. Thank you! You’re welcome! Please let us know how it goes.